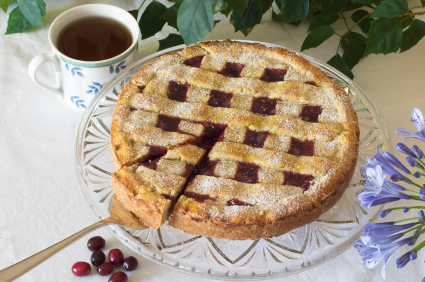 The Linzer cake is to be said to be the oldest-known in the world. For a long time a recipe from 1696 in the city library of Vienna was the oldest one known. But in 2005 the library director of the upper Austrian Museum found an older recipe from 1653 of Verona. There are numerous legends of how that recipe came about. One is that a confectioner of Vienna named Linzer invented it. Another one is about the sugar baker Johann Konrad Vogel of Linz (1796–1883) who started in 1823 the a mass production of the cake that made it famous around the world. Some claim that the cake started its popularity at a traditional cafe of Budapest, the Ruszwurm cukrászda. And how did it come to the USA? Supposedly by the Austrian Franz Hölzlhuber who brought the Linzer Torte in the 1850s to Milwaukee, from where it spread over the United States. In Germany the Linzer cake is a typical Christmas cake but that does not mean you cannot bake it throughout the year. Happy Baking! - Mix sugar and butter and beat until foamy, add eggs. - Add hazelnut/almond flour and flour, 1 egg, cocoa and all spices. - Mix well and knead until you get a smooth dough. Form a ball. - Keep it cool for at least 1 hour (wrapped in foil). - Grease a round cake pan (10 inches) and sprinkle bottom with some flour. - Roll the dough 8mm (1/4 inch) thick - keep some dough for the decorative grid on the top. - Place dough into the cake pan up to the edges. - Mix jam with Schnaps (optional); spread jam all over the dough (2mm thick). - Take remaining dough, roll it. Either cut star cookies, or make a grid which will be placed on top of the jam. - For the wash: Whisk the other egg with a fork in a bowl. Brush it over the dough grid. - Bake the cake for 30-35 minutes on 175°C or 347 F.
Before serving add powdered sugar on the grid; let the cake sit at least at a cool place for 1 day before serving! You can store the Linzer Cake for 2-3 weeks; just keep it at a cool place and covered.